Long-time Bellingham-area resident Cayley Schmid has made folk music the central focus of her life — through teaching, performance and organizing area festivals and clubs — while sharing that love of music with the Whatcom County community. Schmid moved to the Bellingham area at the age of 5 from Vancouver, B.C. and has lived in Bellingham and Ferndale ever since. Schmid’s parents, also residents of Whatcom County, have always supported her music education. Her father, Rob Schmid, works as a local builder and her mother, Zynet Schmid, works for the Whatcom County Library System. As a child, Schmid traveled and performed competitively throughout the Pacific Northwest, Canada, and even Australia in Scottish highland dancing with Bellingham’s Clan Heather Dancers. “I danced to Scottish music, but would hang around after my lesson to watch the Irish dancing class and that was my first introduction to Celtic music. My parents had Chieftains and Natalie MacMaster records and took me to see Riverdance,” explains Schmid of how she found Irish music. Schmid recently opened Bellingham Folk School to focus on group lessons for children and adults. Photo courtesy: Cayley Schmid. Throughout middle and high school, Schmid took lessons from Schaad and, after graduating, she was invited to perform with Schaad on fiddle and a little bodhran (Irish hand drum). “Looking back, I had no idea how special that was, and I feel so much more comfortable now as a performer because of that experience,” note Schmid. But coming back to Western just didn’t feel right so Schmid made a new plan—a plan to take workshops to expand her experience and immerse herself in the folk scene. Meanwhile, Schaad chose to leave Bellingham and in the process, needed someone to take on her large group of music students. Schaad chose her protégé and Schmid accepted the challenge. “All of a sudden I stopped taking lessons and I was teaching them—lots of them. That’s when I realized I could do it and that I really enjoyed it. But I felt like I needed to keep taking lessons so that I could give them,” explains Schmid. Polecat has performed comfortably together for six years. 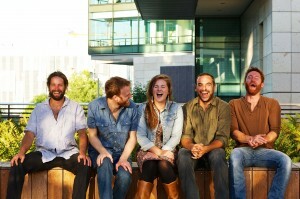 (L to R) Richard Reeves, Karl Olson, Cayley Schmid, Aaron Guest, and Jeremy Elliott. Photo credit: Jonathan Gipaya. 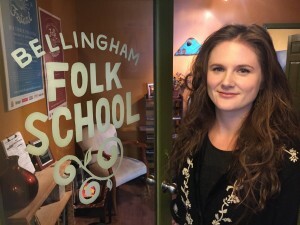 To create a local opportunity for her students and others in the community, Schmid created the Bellingham Folk Festival. The festival is held in January each year and includes three days of inspiring workshops by local and visiting teachers plus performances, dances, and jams for all ages and abilities. “I hear from the elder community how happy they are that we’re introducing this history to a younger audience. It’s also a great opportunity for young people to see their peers into to the same thing and bringing people together,” notes Schmid. After she got the festival rolling, Schmid realized she wanted it to happen more often than a single weekend each year. “The Bellingham Folk School came about because I wanted to start teaching group lessons on a drop-in basis without a lot of cost. We want kids to come try it and see how much fun it is,” explains Schmid. Three different levels of children’s classes are available as well as one for adults. Located next to Allegro Strings on Cornwall Avenue, just down from The Leopold, the Bellingham Folk School is also available for use by other Whatcom County music teachers and performers. 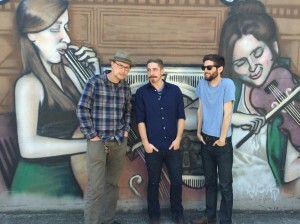 Giants’ Causeway members (L to R) David Lofgren, Zach Bauman, and Sam Vogt stand before a painting of bandmates Clea Taylor and Cayley Schmid at McKay’s Taphouse. Photo courtesy: Cayley Schmid. When not teaching, Schmid plays fiddle with two Bellingham-based bands. Giants’ Causeway is an Irish and Scottish folk band that includes cellist Clea Taylor who has played with Schmid for seven years, plus Sam Vogt on guitar, Zach Bauman on mandolin, and David Lofgren on bodhran. “When Clea and I met, we thought we were the only people in Bellingham that liked Irish music. We played weekly gigs at McKay’s Taphouse, Uisce, and the Copper Hog for a year. Then when we met Sam and found out he loved Irish music too, and it was no-b that we would be in a band together,” says Schmid, laughing. 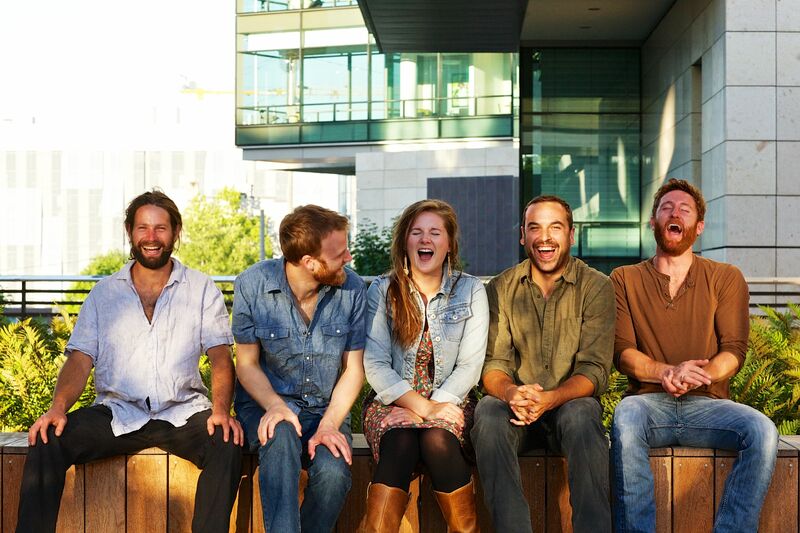 Polecat started in March 2010 and Schmid and Guest started dating — with the band’s permission — in August of that year. “We had a meeting about it. It can really mess things up, but they said okay. We got engaged in September of 2014 and married in October of 2015,” Schmid shares. “As my interests and obligations have grown, Aaron has taken on more and more of the Polecat responsibilities. In the band, we’re like the mom and dad. It’s almost more like a domestic partnership than a business partnership,” adds Schmid, laughing. 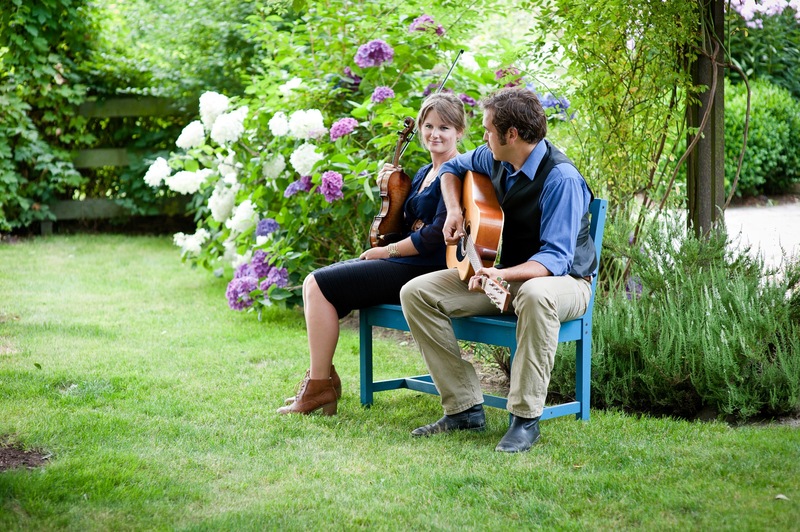 Schmid and husband and bandmate, Aaron Guest, live, work, and perform together. Photo courtesy: Cayley Schmid. Now that they’ve been playing together for several years, Polecat is enjoying the freedom to be selective about their gigs and are able to balance performance with other parts of life. “We’re not road warriors. I’ve been able to have students, manage the festival, the Ceili Club, have Giants’ Causeway, and family all at the same time. That balance is important to us,” explains Schmid.